Swimming is a great way for you and your baby to bond, but there are a few things you should consider before venturing off to the pool with your little one, like what swim nappy to pack! Why do you need a swim nappy? Swimming pools will insist that you use a swim nappy for your baby to keep any poo from leaking into the pool. Everyday nappies are not suitable for use in a pool as they will absorb water and make it difficult for your baby to move around in the pool. Normal swimwear on its own will give no protection against any accidental number twos, so you really need a swim nappy to stop any poo incidents. But which one will give your little one the best protection and stop you from hanging your head in shame for years to come at your local pool because your little one did a number 2 five minutes into their swimming session? If you’re used to using disposable nappies then there are disposable swim nappy options available, but how would you fancy wearing a plasticky swimming suit in the water every week or on a hot sunny day? We sure wouldn’t and doubt your baby’s delicate skin would appreciate it either! TotsBots reusable swim nappies are specifically designed to ensure that your baby is happy and comfortable in the water and that you have an enjoyable and stress (and poo!) free experience. They are lightweight and have a super soft fleece lining which won’t absorb any pool water, leaving your baby to enjoy their time at the swimming pool in style. Before you buy any sort of swim nappy, it’s a good idea to check the recommended size and what weight range this will cover. TotsBots swim nappies come in two sizes and have the benefit of having a hook and loop fastening so that you get a good fit every time without having to buy lots of different nappy sizes. It also makes the swim nappy easier to get on and take it off your baby, particularly when soiled. Having to try and get a poopy up-down swim nappy off your baby when they are cold and wet is never easy…and not very enjoyable either! We speak from experience. What are the benefits of using reusable swim nappies? 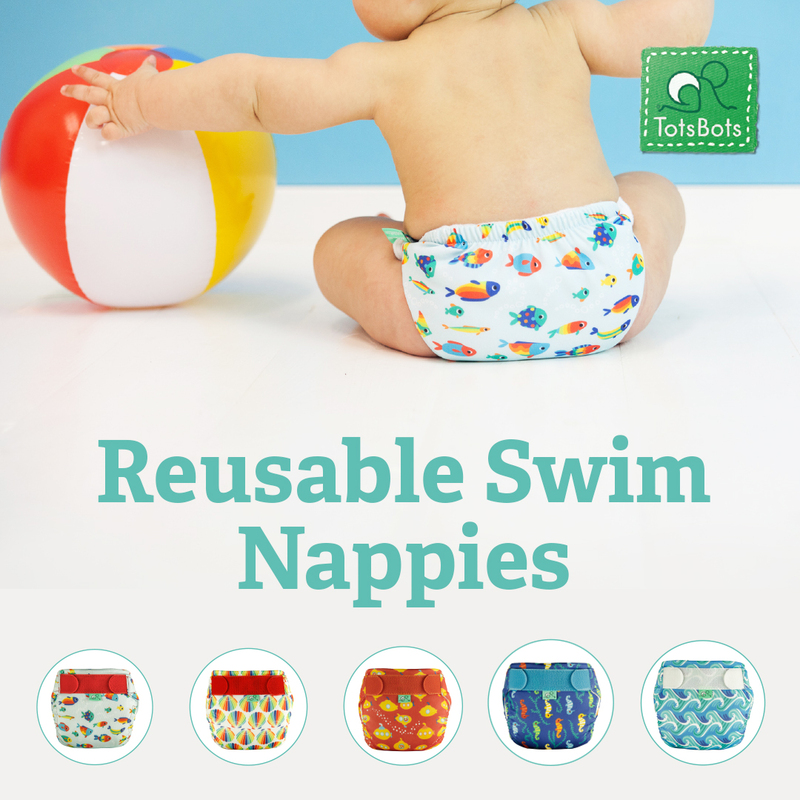 We’ve already mentioned that reusable swim nappies are more comfortable for your baby, so if you take your baby swimming a lot or are planning on going on holiday, then TotsBots swim nappies are a must! They can save you a bit of money, are better for the environment and you only need around two swim nappies for a holiday in the sun, versus a couple of packs of disposables in your case. More room for other essentials or that extra pair of shoes you we’re unsure about taking! Do I need to use anything else with a TotsBots swim nappy? For a trip to your local swimming pool or a day at the beach, all you need is a reusable swim nappy, however for baby and toddler swim classes you usually need to use a double nappy system. You can still use a TotsBots swim nappy underneath their suggested neoprene nappy to ensure that your baby is comfortable and happy. If you agree that reusable swim nappies are a no brainer and perfect for your summer holiday, you can shop our full range HERE. The most difficult decision is choosing which of our prints to buy!